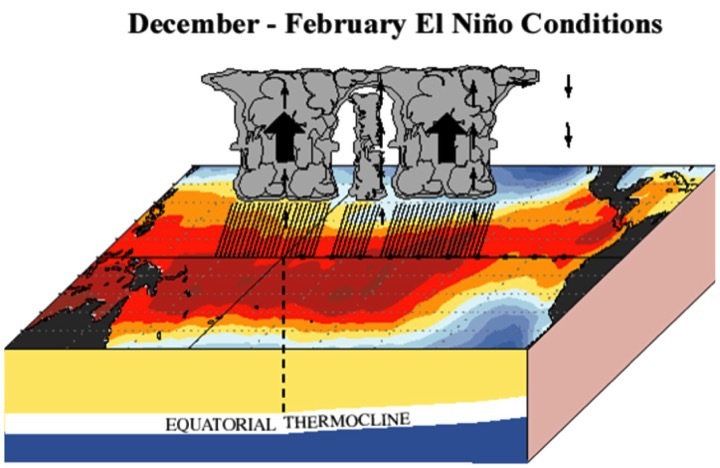 What Causes an El Niño? Lower Atmospheric Circulation: Towards the East (western Pacific) and towards the west, but weaker (eastern Pacific)– Surface air pressure is anomalously low over the central equatorial Pacific, for example Tahiti, and anomalously high in the western equatorial Pacific, for example Australia. This reduced gradient in surface air pressure drives a flow of surface air moving from higher pressure to lower pressure, or west to east across the western equatorial Pacific. Across the eastern Pacific, the usually strong east to west wind is suppressed. Surface Water Circulation: Towards the East– The lower atmospheric circulation has a direct effect on the surface water beneath it. In the western Pacific, the west to east movement of air in the lower atmosphere along the equatorial Pacific Ocean works on the water below it. During El Niño conditions, this means net surface water transport from west to east resulting in warmer than average surface water temperatures in the central and eastern Pacific. Upper Atmospheric Circulation: Towards the West– Low level winds converge over the anomalous warm waters of the central and eastern Pacific and rise. The forced ascent of the very moist air creates heavy rainfall in the region, wringing the air of moisture. The now dry air diverges out of the top of the convective region, moving out over the western Pacific to sink over the cooler than average waters. 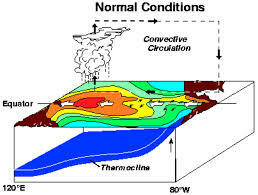 Thermocline: Decrease in slope, slanted down from the eastern Pacific to the western Pacific-The thermocline marks the transition between the warm upper water and the cold deep water in the Pacific Ocean. The decrease in slope suppresses upwelling from cold water in the eastern equatorial pacific and allows warm water from the western pacific to flow eastward towards South America. This animation is an exciting new tool to raise awareness of the science and impacts of El Niño and La Niña and encourage Pacific Islanders to take early action in preparing for these extreme events. The film stars a comical and highly resilient crab and follows her escapades across the Pacific. The animation comes with a resource ‘tool kit’ to help facilitators link the information in the film with smart decision-making and action on the ground. You can download The Pacific Adventures of the Climate Crab animation and screen it in your community or workplace.